The vast majority of specimens are at the Field Museum of Natural History herbarium; acronym = F. A few specimens from each foray are at other institutional herbaria. See Contacts for questions on the voucher program or specimens. The data and images are available online through several sources. Field Museum Herbarium Database. To use this database search form (as of 2017) do the following. To find all specimens for a particular year (for example 2016), enter "NAMA 2016" in the Collector Number field. Searches can also be narrowed down by family, genus, identifier, collector, or state/province. You can try entering your name in the Collector(s) field. Mycology Collections Portal. The data and images from the Field Museum are pushed to the MyCoPortal system. Searching here (currently as of 2017) is not as easy because a search string for Collector's Number must be complete and not partial. "NAMA 2016-003" works to find one collection but "NAMA 2017" does not return results. Hopefully this can be improved. Mushroom Observer Species Lists. 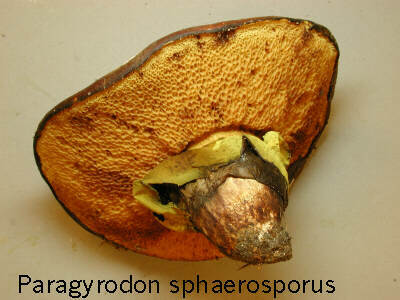 The images for voucher specimens from recent forays are posted on Mushroom Observer. All available documents and links for voucher data are provided here: 1997 to present. We are missing species lists for these NAMA forays: 1961 OH, 1967 MI, 1985 WV, 1993 WA, 1996 VT. If you are able to locate any of these lists please send them to us. © Copyright North American Mycological Association 1997 - 2017. All rights reserved.